The following abuses of the election polling station rules fall in to several categories that are briefly detailed below. Predominately all abuse of election and polling rules came from either government staff or pro-government USDP members. Government staff included polling station employees, soldiers, administrative staff and members of the election commission (EC) that have dictated rules throughout the entire period of this election. Abuses ranged through 5 predominant categories, all resulting in either a vote for the pro-government party, a loss of a vote for the opposition, or failure to address in anyway blatant violations of election and polling station rules. Cases of intimidation of opposition voters were mostly carried out by USDP members with large numbers of members grouped in key areas, or though intimidating language or action. Similarly in cases of partial security and staff, polling station staff, guards, and USDP members would openly pressure voters to support the USDP by, or attempt to drive opposition voters away. In cases of ballot manipulation polling both staff or USDP members either pressured voters to support the USDP, or they actively filled in ballots for voters with votes for the USDP despite a voters possible preference for another party. In cases of voting record manipulation polling station staff and possibly members of the election commission appeared to have lost crucial lists of valid voters who were subsequently unable to vote when they arrived, or voters found they have been listed as advanced voters and denied a ballot as votes had been cast in their name by unidentified person. In the same category civilians reported cases where large numbers of ‘advanced votes’ appeared at the beginning of the day, or the end, that overwhelmingly favored the USDP. Lastly, in cases where polling staff or USDP members were either intimidating voters or using voters ballots to cast votes for the USDP, no serious effort was made or action was taken by area election commission to stop abuses of election rules and the manipulation of votes. All off the accounts were gathered on November 7th as polling events unfolded, or the day after when victims of abuse were able to speak with HURFOM’s field reporters. The interviews were collected in 5 townships in Mon State– Mudon, Kyaikmayaw, Thanbyuzayart, Ye and Chaung Zone over two days. 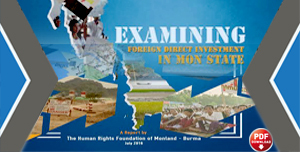 Given the widespread and fractured nature of reporting on the November 7th election in the sever security conditions set by SPDC, these accounts provide a strong clear sampling of abuses more widely practiced throughout Burma. Since 7:00 am, the USDP (members) were active at the No. 1 polling station wearing diaq pouns with green longis or ordinary clothes. Around 7:30 am, I don’t know whether (they) got the poll station officer’s permission or not; U Cho, a member of Wattae VPDC, and 3 members were found entering the poll station wearing USDA diaq pouns. In reality, no one is supposed to interfere without permission, except poll station workers and voters. What happened next is those persons began shouting ‘The right mark is beside the Lion. Support the Lion. The Lion! The Lion Logo!’ , which was intended to pressure the prominent persons and locals who came to vote. The other party members were unhappy with what happened. Especially, [the members of] the All Mon Region Democracy Party, who reported [the event] to the polling station officer. However, the poll station officer passed [the case] to the Township Commission. These cases continued up until 9:00 am. After analyzing, it was found that the USDP members were very afraid of their rivals, the AMRDP. Since 7:00 am, the locals had predominantly voted for the Mon party. It seemed that their [USDP] informants [likely poling staff] in the poll station informed some USDP members and the VPDC authorities of [the AMRDP success]. As I guess, up to two weeks prior to the election, Mon citizens had already proclaimed that any party except the Mon party would not win. It was not a surprise that the locals had mostly voted for the Mon party on the voting day of [November] 7. At that time, it was possible that the USDP [members] entered the poll station and pressured the citizens because they knew that they were in a bad situation. Anyhow, based on the fact that they conducted the campaigns with government support, [they collected] the early votes, and that they had the right to interfere at the polling station manipulate the votes on the last day…no one could deny that they are not the government party. The advanced vote collecting was not include in the aforementioned interference and election manipulation. Everybody knows that according to the votes the USDP got on the 7th, they would lose to the Mon party by a landslide if the advanced votes were not included. Several residents of Kamawet village reported to a HURFOM field reporter a case of ballot manipulation and voting record manipulation that led to 64% of the villages eligible voters being unable to vote. Prior to the election, Kamawet village had 2500 eligible voters listed on election documents, according to residents. On election day only 900 of the valid voters were able to collect their ballot papers to fill out at the poling booths. It is unclear where the remaining ballots went, though reporters were able to confirm that 1200 of those ballots had mean transformed into advanced votes with out the voters knowledge or consent, and had already been cast by unknown people. As I know, the particular poll station authorities did not deliver the ballot papers for all the voters. According to Min Oo, a USDP member, these [advanced] ballot papers were already put in on the list of advanced votes during the previous days [before the election]. As I noticed, most of the marks on the advanced votes ballots were made by themselves [the USDP]. Moreover, there was a lot of evidence that the USDP was using [the power of] the authorities; their party [USDP] forced the locals to mark in the Lion’s squares in front of them…I want to say that it will not be a surprise on me if they win. What I said now exactly represents what has happened in our region. On the morning of that day the time was about 8 o’clock. Two school teachers – Ma Htay Hlaing and Daw Swae who are USDP members – pressured the students’ parents who came to vote in the poll station saying, ‘Vote for the USDP. Tick the right marks.’ That’s my own experience. They are schoolteachers, so no one replied. I am not sure whether some students’ parents voted [for the USDP] because of their children’s teachers’ campaign. I didn’t vote for them. I mean that unlike other party members, they [the teachers] could interfere as they wanted in the voting processes since they [had the duties of] polling station workers. It was unfair. And then they left the poll station because the AMRDP members immediately informed the Township [Election] Commission [about those efforts]. In conclusion, I don’t feel surprised that they won the votes in this region. People said that they won the vote with the early votes which they got unjustly. This morning at 9 AM or so, when I came to the polling station where I am competing for State Hluw Htaw candidate, I saw the USDP candidates were [committing] electoral fraud in the station, especially it [was] happening in Juin Pan village. At the polling station, three USDP candidates are casting the voters [ballots] in the station. When I become angry with that, they stopped casting the votes. They are casting [other peoples] votes as they think it is legal. Besides casting the votes illegally at the polling stations in Juin Pan village, the members of Village Peace and Development Council (VPDC) are casting the votes for the USDP at polling station No.2 in Wad Tal village [and Winn Dar village]. The polling station officer did not say anything even though he saw that the VPDC members are casting the ballots for the USDP. However, because of this, we went to the Mudon Township Election Commission to file a case with them about that. They only said they would pass the word on to the right people. And in Nyaung Kon village, Daw Htay Htay Hlaing, who is a Health Department servant and who was giving the ballots to voters, aged 32, checked the ballots on behalf of voters even though that is not her responsibility. Yet despite this, when we told the polling booth officers, they ignored those [abuses]. That is how they are cheating at the polling stations. At that day, I and my mother went to [the poll station to] cast our votes. We brought our national ID cards. My mother is over 60 and needs help to walk because she has arthritis in legs. So I and my uncle had to accompany her. When we reached near the polling station, it was impossible to vote simultaneously. My mother needed my help, so I cast my vote first. While I was voting, all the persons I met were government supporters except the poll station workers, other party representatives and sub-poll station officers. I [also] saw some familiar USDP members. They were sitting in the registration-seats [waiting] to vote [on other peoples ballots]. In fact, they [USDP members] should not have been there. The place is only for the responsible polling station workers. After voting, I accompanied my mother, but the USDP members forcibly pushed me and my uncle saying ‘You don’t enter. We will accompany this aunt’ and escorted her to go vote. After she came out, I asked my mother whom she voted for. She said she did nothing. The person who escorted her did the registration by themselves, ticked the mark, and cast her vote. After that I clearly understood that to get a vote for them [USDP] from my mother, they behaved in that way. I found that when the old men and women were voting, they [USDP members] continuously accompanied them to ‘help’. What bad men! They are USDP’s members. Up to forty or fifty members were active around each polling station to show their strength. In our Kankalay region, over 60 [members] was standing up at the entrance [of the] road of the poll station and outside the poll station. And then, in a poll station of Nyaung Gone where they [were] found; I think they felt awkward seeing Mon citizens were voting for the Mon party, so two or three of them came to the voters pretending to help, and made the marks on their [USDP party] spaces. A woman in our ward described this type of event. She had a surgery on one side of her eye, and a USDP [member] accompanied her [to the voting room]. After that, saying ‘Please give me [your ballot], Aunt’, he made a mark [for her]. That aunt retold me that she went [to the polling station] to vote for the AMRDP but her vote was transformed into the other [parties] vote after her arrival [at the poll station]. Captain Khin Maung Cho ordered village headmen to gather the villagers in their respective villages and to go to the polling stations to vote. The reason why the order was given is that on Nov.7th, until 11 AM, no one came to the polling stations to cast the votes; therefore, they [USDP] become worried about the turnout, and they the USDP asked the LIB No.106 Captain Khin Maung Cho to give order. And there come an order from Captain Khin Maung Cho. Those villages ordered by Captain Khin Maung Cho to come to polling station are predominantly Karen. Despite the orders residents from 9 of the villages continued to refuse participation and no villagers were known to have traveled to polling stations. According to member of the AMRDP who wished to remain anonymous, after cases of ballot manipulation and intimidation against voters by USDP members was witnessed in Mudon Township, representatives from the AMRDP tried to report the violation of election rules to the township Election Commission. However, the complain was effectively ignored as the AMRDP members were told by the EC officers that their party should try to negotiate with the offending USDP members to reach some sort of agreement or settlement. Another instance of election fraud though the manipulation of election lists and ballot manipulation was reported In Chaung Zone Township. There a list of legitimate voters was collected by the government and initially shown to Chaung Zone parties. But on election day close to 500 names on the initial list had been removed. It is not entirely clear why or when the names were removed, but the absence is believed to have a significant impact on electing representatives for three Hluttaws(Houses). A representative from the AMRDP who coordinated reporting on election abuses described how in key villages such as Mudoon village in Chaung Zone Township, only 10 miles from Moulmein, the Capital of Mon State, hundreds of votes from authorized voters mysteriously disappeared from voter lists at polling stations on November 7th. There was a load of ballot manipulation at Kamawet village [Seintaung quarter]. The main problem is that we cannot differentiate between the polling station workers and the USDP’s members. Especially [because] the school teachers who work in the polling stations are dressed like the USDP’s members. Originally, the citizens see the USDP’s members as problem-makers, so they are worried when they could not determine whether the people in the polling stations were USDP members or poll station workers. Because [of this] some [voters] are stressed that if they did not vote for the USDP, they will face problems as a consequence. Today there is no problem to [be] discussed regarding the National Unity Party (NUP). They acted with great care. The Mon party group has stayed clear [of ballot manipulation]… The busy persons were the USDP members with the white Diaq Poun and were noisy and found everywhere. Now we are talking about the ballot manipulation that is happening on this [November] 7th election day but not about the unfair advance votes obtained by junta-backed political parties. It happened like that [ballot manipulation, intimidation] at almost every polling station, [with] the members of USDP waiting at the entrance of polling booths and frightening voters to vote for it [the USDP]. 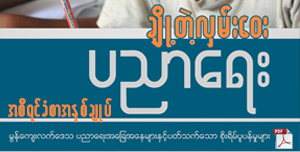 By acting like [they are] helping voters on how to vote and list their names on the voting-registration document, the USDP members make the voter [ticks in] their vote box [USDP’s vote box] and by saying, ‘Just check here [indicating the USDP’s vote box].’ Also by driving away other political parties’ members outside of the polling booths; so, here, when they [other political parties’ members] are outside, they [USDP members and assistants of USDP members] can do whatever they want to. Despite [the efforts] to do things illegally like this, we Mon people still prefer to vote for the AMRDP rather than other political parties. That village is the Kyeik Paran village where AMRDP candidates are not allowed to enter the polling stations. The polling station guards said to AMRDP members that ‘you are not allowed to go into because the logo stamped by Township election commission is not inked clearly.’ That is the guard who is waiting at the entrance of Kyeik Paran polling station and who does not allow the AMRDP members get into the station. Well, here apparently that guard is a proxy of the USDP. And in order to do whatever they [USDP] want to do in the polling station, they drive the opposition members out. Everywhere there were mostly USDP members. The other parties did nothing. They stayed calmly at their specified places. Only they [the USDP members] and VPDC members were in a rush. They were entering and leaving the poll station as they liked. I was going to vote on that day. My name was on [the list of people who can vote] but I did not vote. I didn’t thoroughly know about ballot manipulation. One unjust thing that I encountered was that at the poll station No. 2 of Kyone Phite village, USDP member U Soe Thein and his village organizing groups entered the poll station and closely told the voters to tick the right mark at their Lion image. I heard about that from my friend who casted his vote in person. There is no one in this Kyone Phite village who does not know USDP member Ko Soe Thein. [He is] he not popular [and does not have] a good reputation. And then, I could see from the tea shop that there were the USDP members – Ma Moe Khine and Ko Soe Aung outside the poll station, and those youths [that tired to] coerce the people at the entrance of the poll station. Why I said that was unfair, is that even the similar party derived from the government, the National Unity Party [NUP], had no right to do so. I heard that in some places, the Mon party had no right to enter the poll station. There was no equal rights. Yes, that is right about the lost votes. When we talk about the lost votes we mean that the AMRDP lost numerous votes that it could have gained. That happened in Mudoon village… In Mudoon village, Chaung Zone Township, there are over 500 eligible voters. And over 500 ballots have been lost. The reason why over 500 ballots have been lost is, I think, because of how the people who are in charge of polling stations, have done. I think, they should be [held] responsible for that [loss] for the upcoming [election related] problems. 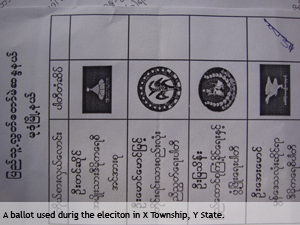 As I knew from my monastery supporters, who went [to the poll stations] to cast their votes, the USDP’s members did a ton of ballot manipulation on that day….If the voters seemed [to] know-nothing and [were] afraid, they [USDP members] would themselves make the marks on the ballot papers. And then [there were] ways in which they mentally pressured the voters. They indirectly said, coerced and even intimidated [voters] – inside the compound of poll stations – saying that if you did not support them [the USDP], you will likely be in trouble. My supporters told me that this sort of indirect intimidation has occurred very frequently. Therefore, if they [USDP] win in the end, we needn’t feel surprised. By checking closely, I found that all votes have been marked by similar ink color and suspected that they might marked by the same person. Of course, the ballot papers were marked only in the box for the Union Solidarity and Development Party (USDP) candidate…Many candidates from AMRDP and NUP asked the Election Commission in Mon State to investigate the advance ballots issue. However, it [EC] took no action to investigate accusations of election fraud according to a supporter of AMRDP in Moulmein City, Mon State. The candidates from those two parties [AMRDP and NUP] in Mon State sent the letter requesting an investigation and action regarding voting advances on November 8th morning. However, all requested letters had been rejected by the Mon State EC. Yes. I lost the seat after the Election Commission (EC) brought in illegal advance votes. I know that I got the majority of the votes from my [Mon] people but later, we [AMRDP] discovered that I had lost…after they added a bag of at least 5,000 advanced votes from an unknown place. The Kyaikmayaw election commission office informed me already about that. As soon as I got the results, I required them to count and investigate the advanced vote issue; however, they refused to do that. 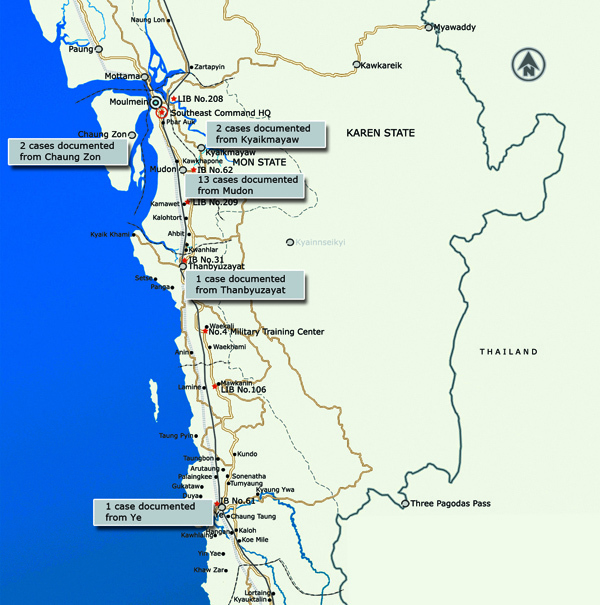 I think the SPDC military commander based at the Southeast Command, Moulmein has power more than the Mon State EC. The Mon State EC members did not dare to hold an investigation into false advanced votes at our request. In this Kamawet village, some people cast their votes, but most people did not go to the polling station. Some people wanted to vote for the party they supported, but had no right to vote. Those people are Mon from Harat quarter. They were already on the list of people who can vote. They already knew their list numbers. However, the list was lost on the voting day. They had to return without voting [after] being informed [they had] no right to vote. It was later known that [the lost list] was due to that the USDP, as they [USDP] knew they are the supporters of the AMRDP and did not allow them to vote. According to the news from internal sources, the VPDC authorities had torn up the list of the people who can vote. As a proverb says “Throw sand on the meat if its not for you.” The votes which would not become theirs were lost from the list. The right to vote was denied by showing there was no list. The Mon party lost (the election) in Kamawet. The whole village knew that the loss was due to the cheating of the USDP and the VPDC. The Mon party has suffered [for it]. 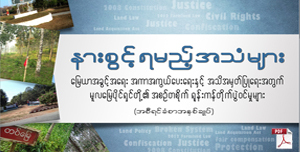 The above map notes the number and area in which HURFOM documented election abuses in Mon State. These accounts collected as the election was occurring or the day after, highlight points at which the regime was able to either actively or through ignorance and confusion, able to manipulate the election in its favor. Strait forward intimidation and ballot manipulation was the most common abuse practiced by government polling both staff and members of the USDP, in the absence of international observers. This was aided by the bias USDP, government administration, polling staff, and soldiers, actively implemented in their jobs throughout election. In cases of voting record manipulation significant swaths of valid voters were denied the opportunity to cast ballots, after either being told they were not on lists, lists had been lost and the ballots were thus invalid, or being told they had in fact already voted in ‘advanced’ despite their not having cast any ballot. In all these cases the failure of the election commission to take action to resolve or curtail these ongoing abuses directly allowed the manipulation of ballots and intimidation of voters to continue with impunity. Having banned international observers and placed strict controls on media during the election, the value of direct accounts of November 7th from eyewitness participants is significant. These accounts highlight the direct evidence of efforts by the regime to manipulate the first poles in 20 years in favor of a party intended since its formation, to perpetuate the rule of the SPDC through a new pro-regime manifestation. Crucially, these accounts also highlight the ways in which the heavy manipulation of the tentative democratic process occurred on the day of the election. With the next election 5 years away, such observations could be crucial in assisting communities to increase awareness of democratic rights and processes’, and how to curtail future abuses of the election system. Traditional Burman clothes worn by the nationalistic pro-government USDP party members. This defacto uniform consist of a white collared shirt, a white traditional jacket called a diaq poun, and a green crosshatched traditional skirt called a longi. The All Mon Region Democratic Party (AMRDP). Poling station rules required people entering poling stations to present their ID to identify who they were, before entering poling stations. In this case USDP were making no effort to present ID or follow the other requirement. Ballots were marked with icon representing each party. In this case the speaker is referring to the USDP’s icon of a lion adjacent to the spot for a tick mark. In this case the villager was present a the beginning of the day during voting when advanced ballots were brought in to include with other ballots that would be cast during the day. At that time no security was taken to conceal the advanced vote ballots that were brought in. 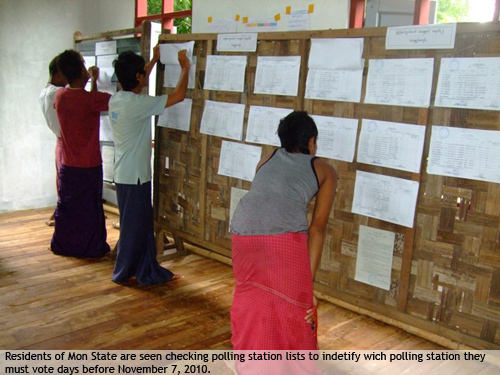 In polling stations throughout Burma, rooms were divided to separate voters from outside influence. Only voters were allowed to pass three check in desks before reaching voting booths. These desks check IDs, distributed ballots, and checked that the ballot was valid and signed. Under election rules these tables were only supposed to be attend by election commission poling station staff. A places for polling station observers from different parties were separated on the other side of the room in a quartered of area. However, in this case the speaker is indicating that the USDP members were sitting with poling station staff behind the 3 check in desks. The speaker is refereeing to the AMRDP, which was the only ethnic Mon party to run in the election. Due to security concerns the names of these villages have been withheld. 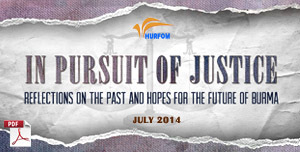 For further information, please contact HURFOM directly. 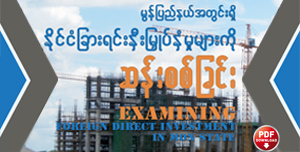 The USDP was created as a pro-government party from the now defunct Union Solidarity and Development Association (USDA). 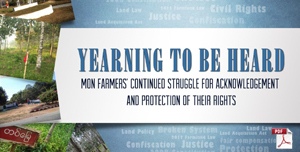 The USDA which was a government run NGO ostensibly used for civil development, has been widely criticized as a directly involved in government directed violence against democracy supporters and political activists including Aung San Su Kyi. Greetings from the Thailand/Burma border. Please take a few minutes of your time your time to complete this simple questioner that will help us improve our reporting to you. 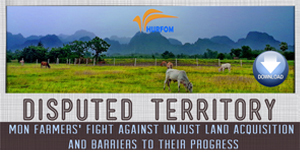 The Human Rights Foundation of Monland (HURFOM), a local ethnic Mon human rights organization, has been sending you The Mon Forum, human rights publication, on a monthly basis for some years. Since then changes in technology have been swift, and we want to get your feedback whether you still require a printed paper publication or whether a digital format would better meet your information, learning, and research needs? The purpose of this feedback to have a concrete decision about our publication by 2011. Please fill out the following feedback form, and send it back to us by mail OR you can send a response via our organization e-mail by giving information whether you need a paper publication or digital publication. 3. If you prefer to receive digital publication, please fill our or your organization’s email address, or your friends or other people, who would want to receive our information.